Anne Applebaum has 2 media appearances. Anne Applebaum discusses Gulag: A History. from the publisher's website The Gulag - the vast array of Soviet concentration camp —was a system of repression and punishment whose rationalized evil and institutionalized inhumanity were rivaled only by the Holocaust. The Gulag entered the world’s historical consciousness in 1972, with the publication of Alexander Solzhenitsyn’s epic oral history of the Soviet camps, The Gulag Archipelago. Since the collapse of the Soviet Union, dozens of memoirs and new studies covering aspects of that system have been published in Russia and the West. Using these new resources as well as her own original historical research, Anne Applebaum has now undertaken, for the first time, a fully documented history of the Soviet camp system, from its origins in the Russian Revolution to its collapse in the era of glasnost. It is an epic feat of investigation and moral reckoning that places the Gulag where it belongs: at the center of our understanding of the troubled history of the twentieth century. Anne Applebaum first lays out the chronological history of the camps and the logic behind their creation, enlargement, and maintenance. The Gulag was first put in place in 1918 after the Russian Revolution. In 1929, Stalin personally decided to expand the camp system, both to use forced labor to accelerate Soviet industrialization and to exploit the natural resources of the country’s barely habitable far northern regions. By the end of the 1930s, labor camps could be found in all twelve of the Soviet Union’s time zones. The system continued to expand throughout the war years, reaching its height only in the early 1950s. From 1929 until the death of Stalin in 1953, some 18 million people passed through this massive system. Of these 18 million, it is estimated that 4.5 million never returned. But the Gulag was not just an economic institution. It also became, over time, a country within a country, almost a separate civilization, with its own laws, customs, literature, folklore, slang, and morality. Topic by topic, Anne Applebaum also examines how life was lived within this shadow country: how prisoners worked, how they ate, where they lived, how they died, how they survived. She examines their guards and their jailers, the horrors of transportation in empty cattle cars, the strange nature of Soviet arrests and trials, the impact of World War II, the relations between different national and religious groups, and the escapes, as well as the extraordinary rebellions that took place in the 1950s. She concludes by examining the disturbing question why the Gulag has remained relatively obscure, in the historical memory of both the former Soviet Union and the West. This month's book is "Iron Curtain: The Crushing of Eastern Europe, 1945-1956" by Anne Applebaum. In her Pulitzer Prize-winning Gulag, the Washington Post columnist definitively profiled one facet of Soviet repression. Her new study of the wider sweep of Soviet influence is an equally comprehensive account of how Communism spread across Eastern Europe. Using newly available archives as well as extensive interviews, Applebaum traces the effects of the totalitarian regime on everyday life, habits, and beliefs. Anne Applebaum attended Yale University and won a Marshall Scholarship to study at the London School of Economics and Oxford University. She moved to Warsaw in 1988 to work for The Economist, providing valuable first-hand reportage on important social and political transitions in Eastern Europe before and after the fall of Communism and the end of the Berlin Wall in 1989. She has been a reporter and editor for the Evening Standard and the Spectator, as well as writing for many other publications, and formerly served as an editorial board member of the Washington Post. She is also Director of Political Studies at the Legatum Institute in London, where she runs projects on political and economic transition. Her second book, Gulag: A History (2003), was awarded the 2004 Pulitzer Prize for nonfiction. Applebaum speaks English, French, Polish and Russian. She is married to Radoslaw Sikorski, a Polish politician and writer and the couple has two sons. In 2005, her husband served as Minister of Defense of the Polish government. 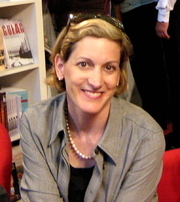 Anne Applebaum is currently considered a "single author." If one or more works are by a distinct, homonymous authors, go ahead and split the author. Anne Applebaum is composed of 5 names. You can examine and separate out names.